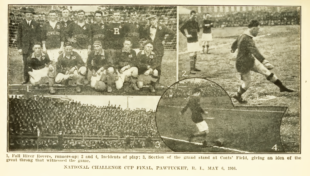 Having played Chicago’s Pullman FC to a scoreless draw in Chicago on April 16, 1916 after what was then the longest road trip in the young history of the National Challenge Cup, known today as the US Open Cup, defending champion Bethlehem Steel FC defeated Pullman in the semifinal replay in Bethlehem 2-1 at Lehigh University’s Taylor Stadium on April 22 to advance to the tournament final in Pawtucket, Rhode Island on May 6. Their opponent would be the Fall River Rovers of Massachusetts. Before the final, Bethlehem’s busy schedule continued. Two days after their semifinal victory over Pullman, Bethlehem traveled to Philadelphia to face Hibernian for a rare Monday game in Philadelphia’s American League. Playing at Potter’s Ground at Front Street and Erie Avenue on April 24, Bethlehem tallied four goals after a scoreless first half to win 4-1. Six days later, the defending National Challenge Cup champions continued play in another national championship tournament, the American Football Association’s American Cup tournament. Bethlehem had won the 1913-1914 edition of the tournament over two legs, drawing 0-0 with 1909-1910 American Cup champions Philadelphia’s Tacony FC on April 19, 1914 at Olympic Park in Paterson, New Jersey before prevailing in the replay at Athletic Park in Newark with a 1-0 victory on May 3, 1914. In the 1914-15 American Cup tournament, Bethlehem advanced as far as the semifinals, losing 2-1 on the road to Brooklyn Celtic on March 14, 1915. 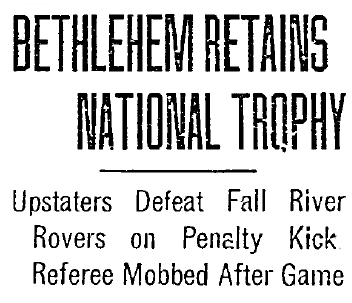 On May 3, 1915, Bethlehem and Brooklyn met again in the final of the 1914-1915 National Challenge Cup. Bethlehem won, 3-1. 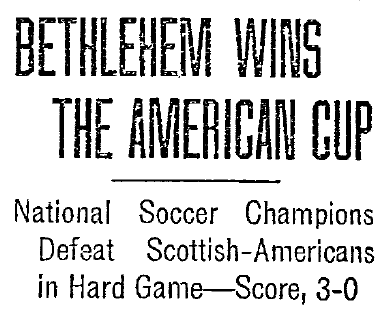 In the 1915-1916 edition of the American Cup, Bethlehem had defeated Hibernian 6-0 in the first round, next defeating Clan MacDonald in the second round, 2-0. On April 30, 1916, Bethlehem traveled to Newark for the quarterfinal game against Jersey City at Federal League Park. Leading 1-0 at the half, Bethlehem finished 5-0 winners. In the American Cup semifinal on May 20, they would travel to face Fall River. Before that, the teams would meet in the National Challenge Cup final. Bethlehem departed by rail for New York City on Thursday, May 4, 1916, travelling by ship that night for Providence and arriving in Pawtucket on the day of the National Challenge Cup final on Saturday, May 6. The fans came to Pawtucket from all parts of New England by autos, train and electric cars, and soon they created a jam at the box offices so great that hundreds clambered over the fence, not so much to evade fare as to get a vantage point before the best seats were gone. The gatemen found it impossible to keep pace with the rush and a good many dollars strayed away from the U.S.F.A. coffers because of the unpreparedness. Bethlehem was on the front foot in the first half. The Spalding Guide reported, “The Rovers had to fight tooth and nail to keep the ball out of their net, but they were equal to the emergency, although three times luck alone saved a score. [Bethlehem center forward] Neil Clarke twice hit the uprights, and once, after some clever passing with Clarke and [outside left Tommy] Fleming, [inside left] Butler drove a cannon-ball shot against the crossbar.” Despite their dominance, Bethlehem could not convert and the half ended with the scoreline at 0-0. 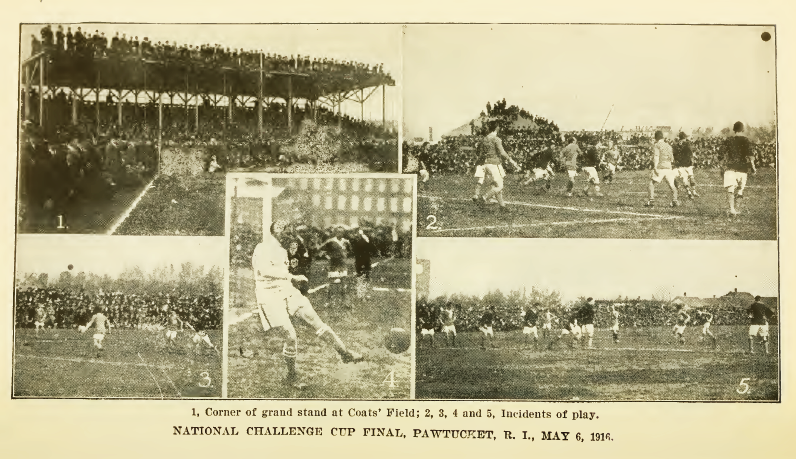 Fall River’s play improved in the second half but still they rarely threatened the Bethlehem goal, and the Spalding Guide reported, “As the time limit approached the game grew rougher and rougher.” In the end, decisions from referee David M. Whyte, who happened to be the president of the National Referees’ Union, would prove to be the turning point of the game. Just as Clarke, the rangy center forward of the Bethlehem team jumped in the air to head a ball toward the Rover goal, Charlie Burns, the Rovers’ left fullback, ducked into Clarke and threw him head-long into the turf. Instantly referee Whyte’s whistle sounded for a penalty kick and the Rovers swarmed around Whyte like a lot of wild men, gesticulating and even threatening the referee. “Sinker” Sullivan, the fiery inside right of the Rovers, persisted in protesting so violently that the hundreds of Fall River rooters in the stands, distinguishable by the yellow cards in their hats, took up the refrain and raised a fearful din of disapproval that continued throughout the remaining ten minutes of play. After cooler heads had prevailed the Rovers drew back and allowed Fleming, the blond outside left of the Bethlehems team to make the free kick. Albin pluckily attempted to save the shot but it whistled by him like a bullet into the net for the goal that won the game. Even as he did he was struck in the back by a fan who had been in the lead in the wild rush at the referee. His failure to call what the Rovers thought was a penalty kick for their team seemed the last straw and in an instant Whyte disappeared in the seething mob. The Pawtucket police headed by Lieut. D. A. Ballou drew their clubs and rushed to the assistance of the players who were doing their best to protect the referee, especially [Rovers right fullback] Booth who was beaten black and blue. Bottles began to fly and the tumult didn’t cease until one of the officers drew his revolver. This cowed the rest into submission and Whyte and the Bethlehem players got off the field into safety…Several players on the Bethlehem team received nasty kicks and bruises, Campbell, Butler, Murray, Ferguson and MacDonald being injured. With the win, Bethlehem became the first team to win consecutive National Challenge Cup titles. They would face Fall River again on May 20 to continue their campaign to become the first team to win both the National Challenge Cup and the American Cup in the same year. Before Bethlehem faced Fall River in the American Cup final, they played two league games at home. As had been the case with both the National Challenge Cup and the American Cup, a winter of bad weather had wreaked havoc on the schedule of Philadelphia’s American League, and this was further compounded for Bethlehem by the team’s games in the National Challenge Cup and the American Cup tournaments, the scheduling of which had also been affected both by the weather and the need for replays after draws. Bethlehem was second in the American League standings, two games behind Disston, which before the start of the 1915-1916 season had played as Tacony FC. On November 20, 1915, Disston had defeated Bethlehem 2-1. Meeting again in a rare Thursday game on May 11, Bethlehem returned the favor with a 2-1 win of their own over Disston. Two days later on May 13, Bethlehem crushed Hibernian 7-0 to draw level with Disston in the American League standings. With order restored, Fall River center forward Tommy Swords soon equalized for the home team, the Globe reporting, “With the score one to one the Fall River fans went wild and kept up a continual din of yelling and shouting.” Two minutes later, Bethlehem retook the lead after outside right George McKelvey scored and the half ended with Bethlehem holding a 2-1 lead. Three weeks later on June 10 at Lehigh University’s Taylor Field, Bethlehem hosted the defending American Cup champions Kearney Scottish Americans in the tournament final. Rain had fallen throughout the week before the game, which was played in front of 5,000 spectators, including two trainloads of fans from northern New Jersey. The final proved to be a chippy affair and the Scottish Americans banged the ball off the woodwork before having a goal called back for offside. Bethlehem center forward Clarke opened the scoring before the end of the first half after heading home a cross from McKelvey. Clarke would score two more times in the second half for the 3-0 win. Before the American Cup final, Bethlehem and Disston met in a playoff game to decide the American League champion. At Tacony Ballpark on May 27, the two teams played to a 0-0 draw. Both teams now had a 9-1-1 record in league play, and although Disston had scored more goals over the course of the season and had a better goal differential than Bethlehem, the teams were declared co-champions. Bethlehem finished the 1915-1916 season with a 27-1-3 record in all competitions, outscoring their opponents 116 goals to 14, including 21 shutouts. After the 2-1 road loss to Disston in league play on November 20, 1915, Bethlehem had gone on a 22-game unbeaten streak. Along the way it became the first team to win consecutive National Challenge Cup titled, and the first team to win the National Challenge Cup and American Cup in the same season.